[02:13:36] <skunkworks_> have one side of the circuit board clear milled. [02:14:17] <skunkworks_> Only had a bit of time. Working well - I used the latest gcode.ulp for eagle - cradek: works awsome. 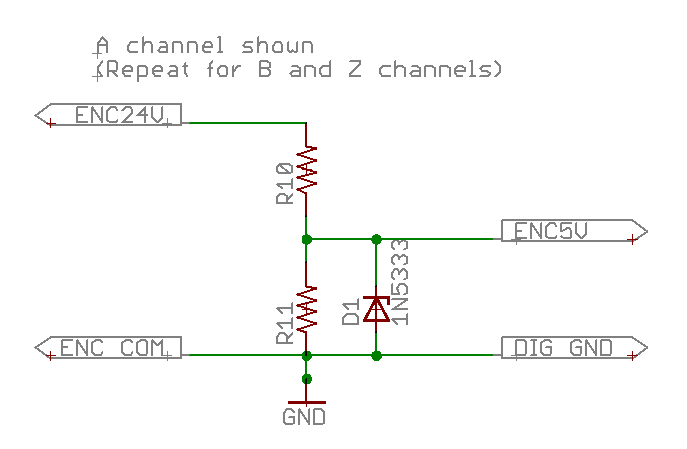 [10:09:55] <anonimasu> anyone have a nice circuit to convert a 24v encoder signal to 5v? [10:19:15] <KimK_IA> how fancy do you need to be? [10:24:03] <anonimasu> mabe I should build a differential opamp stage..
[10:24:38] <anonimasu> that err 19..
[10:25:17] <anonimasu> archivist_ub: low speed and 500ppr..
[10:28:49] <anonimasu> mm.. zener + resistor might be a ides..
[11:43:21] <SWPadnos> they would turn on when you start EMC and remain on until you exit, regardless of estop, machine on/off, etc. [12:16:57] <SWPadnos> are those 3 pins the enables for the 3 axis motor drives? [12:18:19] <SWPadnos> huh. but you need all of them high to allow any motor to move?? [12:25:38] <coden4life> being a programmer (using c and gtk mostly) adding to the tkemc interface to allow for a calbrate or measure of the tool would be nice. [12:31:23] <SWPadnos> how old are the machines? [12:31:57] <SWPadnos> hmmm. interesting. can you tell if it's EMC2 or a modified EMC? [12:34:06] <SWPadnos> out of curiosity, what's so great about their GUI? [12:37:12] <archivist_ub> get on with it SWPadnos ! [12:48:44] <archivist_ub> stick the intarweb back together! [13:14:02] <christel> [Global Notice] Hi all, Apologies for taking you on a detour via Splitsville this morning, the issues were a result of late-scheduled maintenance at NERO. It should all be done now and we'll strive to ensure that we can give you advance warning next time! Thank you for using freenode and apologies for the inconvenience caused. [14:47:47] <renesis> because yeh that feedback based height offset thing is pretty nuts! [15:07:20] <toastatwork> the guns have a little vfd. [15:21:11] <fragalot> school donated me a PC. [15:23:48] <fragalot> I need to figure out how to get it home on my bike first. [15:33:29] <jepler_> toastatwork: yeah, almost all systems with wireless cards have a port called "RJ-45" which can be used to boost signal strength in a point-to-point topology. [15:45:49] <fenn> and some weird limitations that make me think it's not emc-derived, like 9999.999? [15:46:17] <fenn> i think that means parabolas and hyperbolas? [15:46:44] <fenn> same thing isnt it? [15:56:51] <jepler_> To support these other curves, you have to have a nice arc-length parameterization and a nice way to figure out how much of the acceleration is "taken away" from creating the velocity profile for whatever shape is specified by the new curved movement primitive. [15:58:07] <anonimasu> sheetcam is useful..
[15:58:15] <tomp> any confirmation of emc on Brother? [15:59:24] <tomp> goin to Taipei on 15th, will look if i can get away. DT has linux based????!! [15:59:26] <jepler_> since that code hasn't magically appeared in CVS, it seems easier to use algorithms that fit arcs and lines to whatever output you already have. You can determine that a bunch of consecutive points are nearly colinear or cocircular and change the lot to a single linear or circular move. Or if you start with a spline or other parametric description of the tool path, fit directly with arcs using a biarc algorithm. [16:00:28] <SWPadnos> do you need perpendicular accel? [16:08:48] <anonimasu> (I'm not sure if it's already done..
[16:10:34] <anonimasu> A would be rotary right? [16:11:02] <anonimasu> jepler_: same ting as cutting something on a lathe with live tooling..
[16:13:39] <anonimasu> I'll ask again, does anyone know of a easy way to convert a 24v encoder signal to 5v? [16:18:49] <anonimasu> I have thoose..
[16:19:11] <anonimasu> I doubt the encoder will throw spikes..
[16:23:02] <anonimasu> yeah, I can do that..
[16:23:09] <anonimasu> I've got some smt resistors at work..
[16:23:25] <anonimasu> think 100K is too much? [16:23:33] <anonimasu> the pot is 250 and the resistor is 100k..
[16:23:56] <anonimasu> it's a geckodrive..
[16:27:14] <anonimasu> pjm_: yeah, but what kind of resistors does that end up as? [16:29:08] <anonimasu> I think quite a bit..
[16:35:27] <jepler_> Q.) Can I run a 0 – 24V encoder with my G320 or G340? [16:35:27] <jepler_> A.) You must use a +5V encoder with the gecko servo drives. Anything other than that, regardless of how it is powered, is not recommended with the G320 or G340 and will void the warranty. [16:36:24] <anonimasu> jepler_: I didnt get a new drive even though I had warranty and jymm has talked to mariss on the phone about it before..
[16:42:25] <anonimasu> it was a new drive that was doa..
[17:07:26] <tomp> 'member when palin meant michael? [17:08:27] <buckie555> Hello - I'm setting up a 4th axis. Can anyone tell me what the hot keys are for jogging the a axis from the axis gui? [17:09:21] <buckie555> excellent - thanks very much. [17:11:42] <Paragon> Not sure if you guys saw my previous question regarding servo controller. What benifits are ther of having a servo driver use step / dir over EMC pwm etc? [17:12:55] <Paragon> But as far as emc is concerned is it better to get a pwm drive or a step / dir drive? [17:13:49] <buckie555> I've set up the axis as angular (it's a standard 3 axis machine with a 4th rotary axis setup on the bed of the machine). I understand that I can index to a position with a g1 a0, etc, but is there also a way for me to tell the axis to rotate at a given speed until told otherwise? [17:14:03] <Paragon> What about the over head of step pulses compared to pwm and counter pulses? [17:15:46] <SWPadnos> what kind of machine? [17:17:56] <tomp> buckie555: so you want to use a rotary axis to postion to an angle (sometimes) and use it as a speed controlled spindle (sometimes) ? [17:21:31] <buckie555> right - I'll take a look at those. [17:21:34] <tomp> is the top rpm of such an device limited by precision of encoder ( high count + high rpm = too fast too count ) or, does the spindle mode use a single pulse per rpm? [17:23:08] <Paragon> Sorry Chaps the wife just beconned me away. Thanks for the info. [17:27:09] <buckie555> I'm not currently using a brake and the motor is a 1kW AC servo with a continuous torque rating of 6nm so I figure it should be able to hold for the light routing that I'm planning to use it for. [17:29:30] <fragalot> all stores closed, no trains, no bus, no tram, some schools closed too, no government buildings open..
[17:29:40] <anonimasu> where are you canada? [17:30:47] <anonimasu> haha, I would..
[17:30:53] <anonimasu> I'd assume you were from belgium..
[17:31:55] <fragalot> SSH tunnels ftw. [17:33:57] <anonimasu> hm, im going to cut something that looks like a squid. [17:34:08] <anonimasu> to hold my bottle holder in the bathroom..
[17:34:36] <fragalot> is the ubuntu livecd dog slow to boot up for everyone? [17:38:05] <SWPadnos> stage 1 or stage 2? [17:51:12] <anonimasu> tomp: oh, is that the guy without the brake and the Z axis only supported by motor? [17:55:36] <buckie555> There's room on the back of the headstock spindle shaft to fit a brake but I was hoping I wouldn't have to at this stage - rush job! [17:59:39] <cradek> is there no worm? [17:59:46] <tomp> jack screw from lathe bed to face plate/chuck ( just during the time when you want it still) ? [18:01:39] <fragalot> I made it to step 2 of the installation >.> timezone. [18:02:10] <fragalot> cradek: I think this box has like 128 or so, lol. [18:02:33] <buckie555> I noticed in the archives peter wallace recommended upping the servo rate beyond 1ms, has anyone had any experience at higher rates - good or bad? [18:02:38] <fragalot> cradek: We'll see. [18:07:27] <jepler_> SWPadnos: about those pancake servos I bought back at workshop -- do you have a datasheet for them that dimensions the mounting hole locations? [18:13:28] <fragalot> it started the install. [18:14:53] <Paragon> I know this seems dumb but ... I having trouble in choosing a horizontal / vertical rotary table due to size restriction of my mill (Max Travel x=170, y=90, z=115 mm) Iwas looking at a Vertex HV4 100mm but I think it mabe to big. Does any one have any sugestions? [18:15:15] <cradek> what do you need to do with it? [18:19:38] <Paragon> Yes it is. [18:19:52] <cradek> if you load up a typical tool and move all the way up, how far from the table is the tip? [18:22:18] <cradek> surely not r8 like bridgeport size collets? [18:22:54] <anonimasu> hm.. 10arcsec seems to be what people run with vertex tables..
[18:28:25] <Paragon> Yeah that was my worry too. [18:31:33] <Paragon> cradek you gem! :-) that would be perfect. Hope I can convert it to CNC though. [18:32:21] <cradek> I bet you can do it with some experimentation. [18:40:13] <Paragon> BTW my irc usage is pretty lame how do you send a message as you did to me cradek? Do you type the nik of the person first followed by a colon? [18:41:48] <Paragon> Saves on my fingers. [18:44:32] <toastatwork> is it really a matsuura? [18:51:10] <fenn> ISA, does anyone even have computers with ISA bus in them? [18:52:22] <fenn> would a timing belt on the lathe headstock be able to give me enough torque to do the same sort of things as back gear? [18:55:00] <tomp> some early versions of emc talked to pmacs, then the pmac was removed and emc became a software only control. [19:05:44] <tomp> i visited lots of european shops, hospital clean. i been in a zillion us shops, and really clean are not the norm. so that may account for some of it. [19:08:06] <anonimasu> but new buildings/refurbrished and stuff and no welding..
[19:08:19] <anonimasu> and no non work surfaces to collect crap. [19:18:08] <fragalot> (sigh) I keep forgetting to pick up the rest of my controller circuit componements..
[21:26:32] <Paragon> cradek: the swivel base is removable on that item i think. Eventualy I will probably purchase a manual mill which I could also use it on. [21:48:11] <anonimasu> toastydeath: What if you want to machine /\ stuff..
[21:48:39] <anonimasu> I thought the use for sine vises was just htat..
[21:53:14] <Paragon> One thing I will say though is that it is SLOW 5mbs max due to the ARM processor.